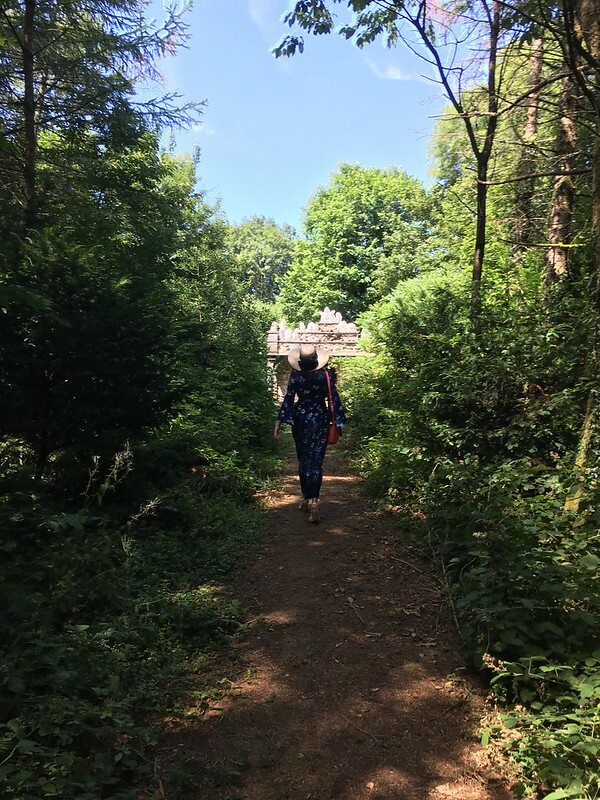 In the woodland surrounding Cilwendeg Mansion in Pembrokeshire, West Wales, lies a secret retreat. Set in a pretty clearing, the Cilwendeg Shell House Hermitage seems transported from fairytales. The name means 'fair white nook', a most fitting title. 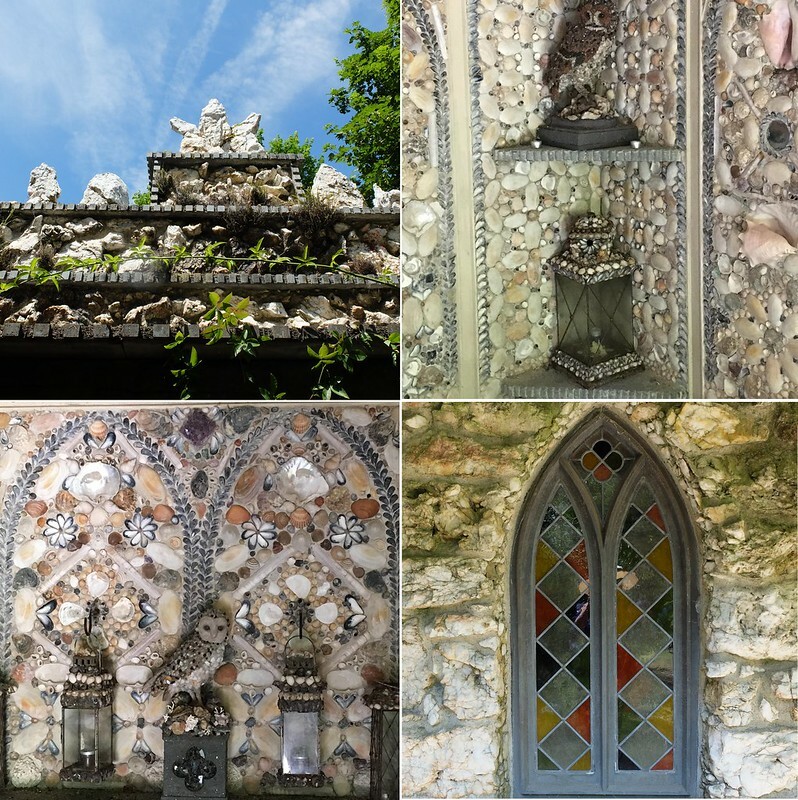 This tiny grotto has a rustic charm from the outside, but stepping inside reveals another layer to this secret - it's entirely decorated with shells, glass fragments, pieces of various minerals, and even animal bones. A number of watchful shell owls are perched around the room, and today visitors may only stand on the threshold, for fear of accidental damage. 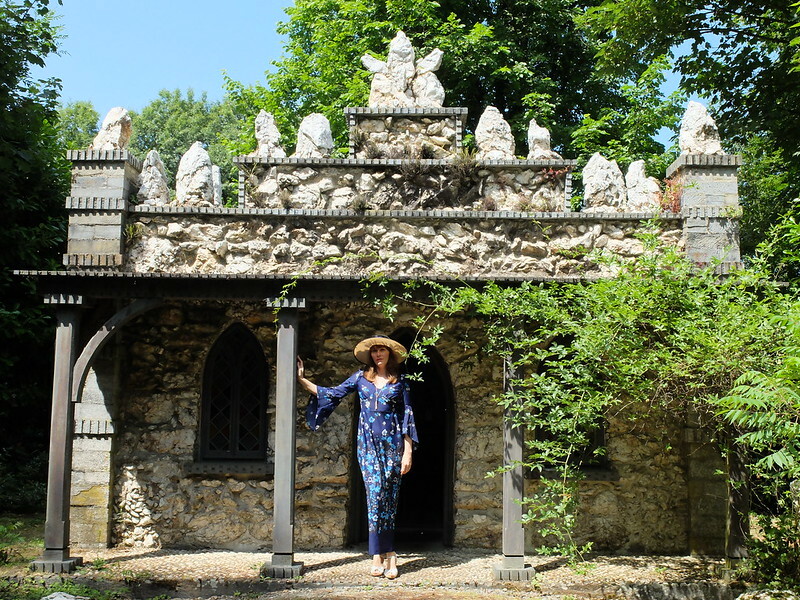 The grotto dates from the 1820s and was partially reconstructed and restored by the Temple Trust. You can read more about Cilwendeg's restoration on their website here. I was so glad to finally be able to visit, as we'd missed it on previous trips to the area due to it only being open on Thursdays from April to September. 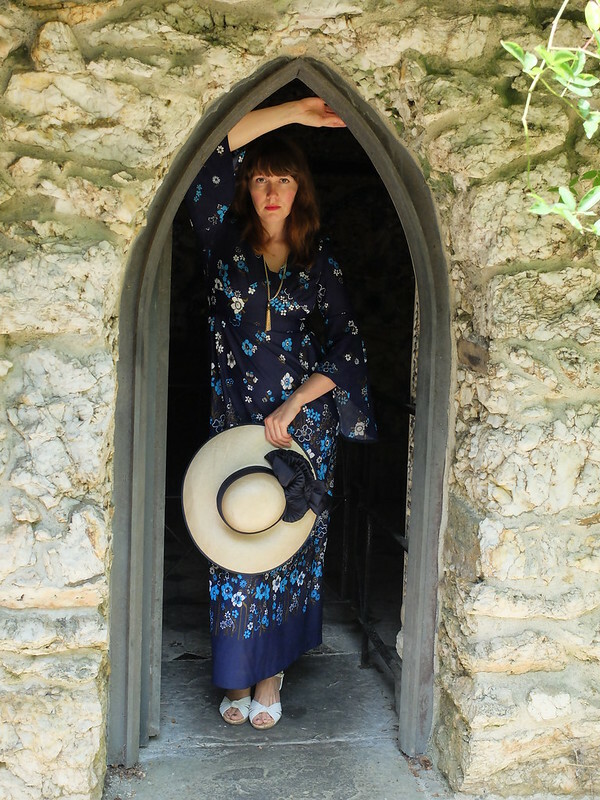 I chose a 1970s dress with slightly medieval looking flounced sleeves, befitting the mythical characters that I imagined might inhabit such a fairytale place. This dress is the 'Roy' brand one that I bought from a charity shop in Cardiff earlier this year. (The name still makes me chuckle, I have various 1970s garments with male brand names that don't sound like a fancy designer at all, 'Clive' being another example!). The colours on this dress are superb, so I kept the accessories neutral to let them stand out. 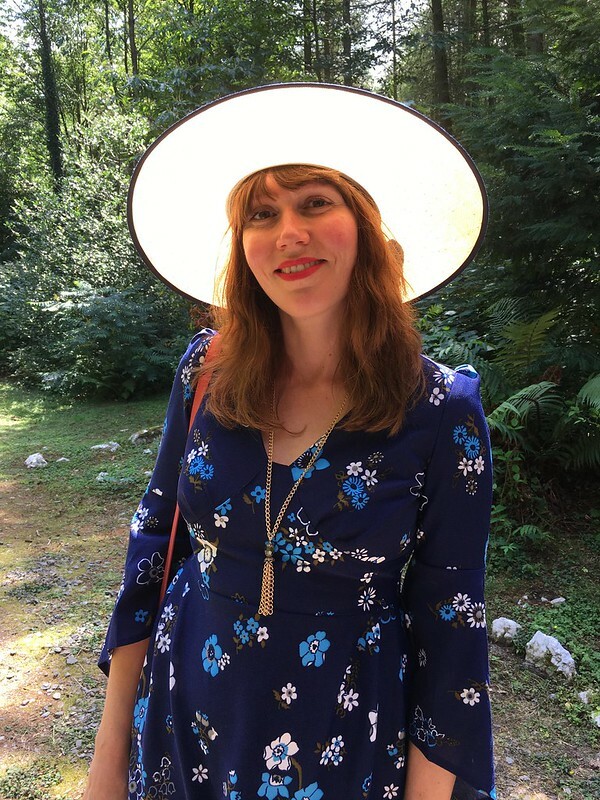 The hat is a really lovely quality one by English milliner Peter Bettley. I can't find much out about it, but understand that the business is still going, now run by Peter's daughter Suzanne. 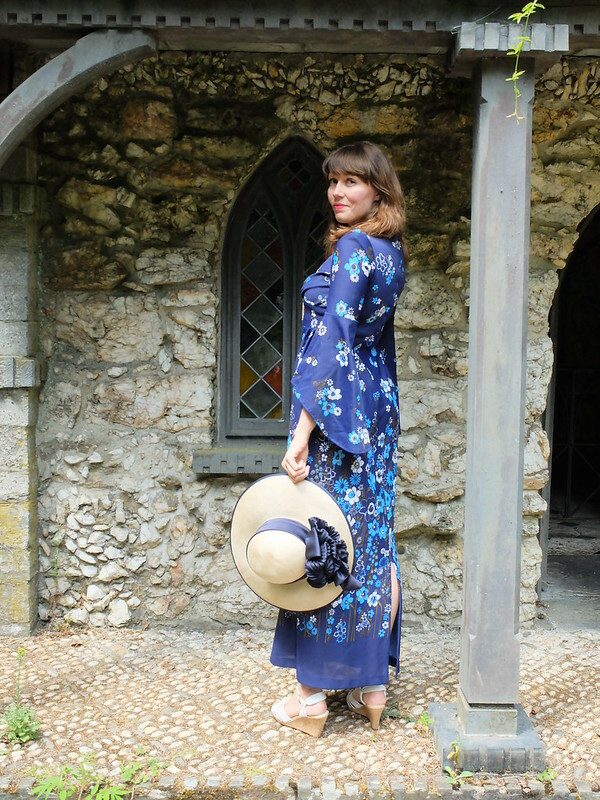 'Roy' vintage dress, Peter Bettley hat, Faith leather wedges all via charity shop. '60s pendant necklace from car boot sale. I'm including this last photo for comedic purposes. 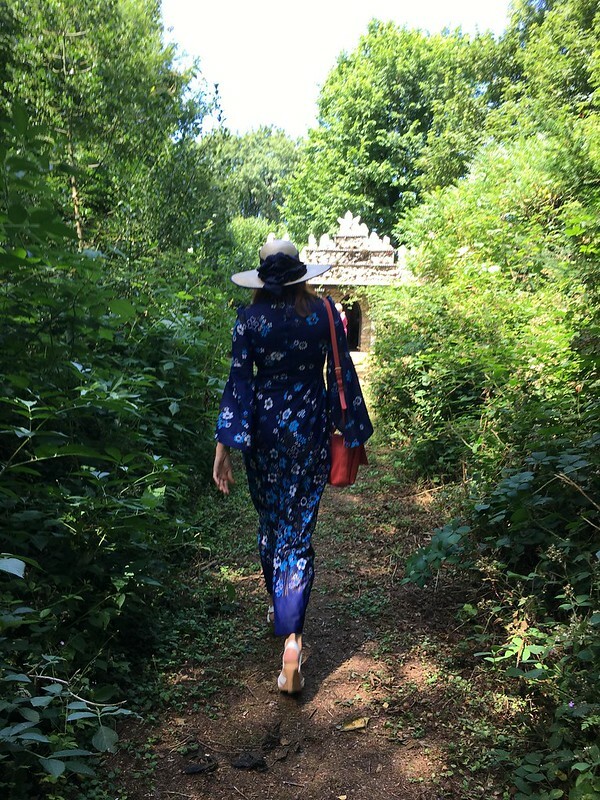 My husband noted how the light in the clearing shone through my hat, creating a halo! Beautiful! Both the shell house as the dress. Aaah, I saw that dress on your IG and thought how lovely it looked. It manages to be both bold and elegant; no mean feat. Those owls are really well-made, aren't they? You can see what species they're meant to be. Such a pretty little Shell House. I saw the IG photo and loved it... your shots here are gorgeous Porcelina. You always manage to pair the dress to the place magically. That house sounds so neat! It reminds me of the follies that I saw just outside of Lisbon when I visited Portugal - they look like they're a thousand years old, but they were only built in the 1800s. It's so cool that they used shells and different found materials in the construction. I really love the owls, they're so beautifully done. 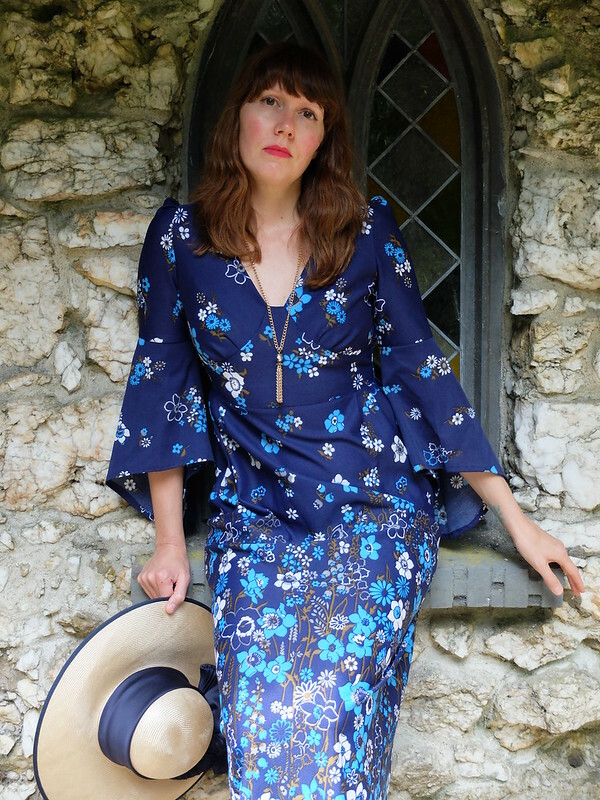 Love this dress, it's the perfect choice for an outing like this! The colors are really striking, and the sleeve detail is, as you said, very medieval. That shell house is wonderful, it looks familiar, I'm sure it must have featured on a tv programme fairly recently as I know I've never been. Oh my gosh, this place looks simply magical!! I love it! And your outfit is dreamy and flowy! So perfect!